High-speed digital targets corrugated packaging - Part 1 | Planet Paper Box Group Inc. In the first of a two-part story, Simon Eccles talks to some of the developers of a new generation of high speed, high volume digital corrugated printing presses. Since this website last took an in-depth look at digital corrugated production systems two years ago, the number of high speed systems on offer has expanded rapidly High speed sheet or web fed production installations are still rare as yet, though the earlier generation of modified multi-pass flatbeds are relatively common. The market potential is huge though: global production of corrugated board is predicted to exceed 260 billion square metres by 2020, growing at a rate of about 5% pa (ICCA Corrugated Statistics). The cost and environmental advantages of producing smaller volumes of corrugated board quickly and on-demand is driving the development of specialist digital printing systems. According to Smithers Pira’s “The Future of Digital Print for Packaging to 2018” report (in 2013), the conversion of corrugated board was expected to increase by over 22 million tonnes between 2014 and 2019, with almost 70% of this increase likely to be in flexo printed materials and a 22% in litho printed applications. However, the highest growth rate will be in digital printing, which was predicted to improve at an annual average of 7.4% from 2014 to 2019. This follows a historical growth of 13.5% annually from 2009 to 2012. There will be presentations on behalf of packaging software and cutting table supplier Esko, brand agency Studio Minerva, corrugated producer Swanline Print Group and corrugated materials supplier Smurfit Kappa. Dave Brunton, a publisher who specialises in packaging, will also give a presentation and chair a discussion. 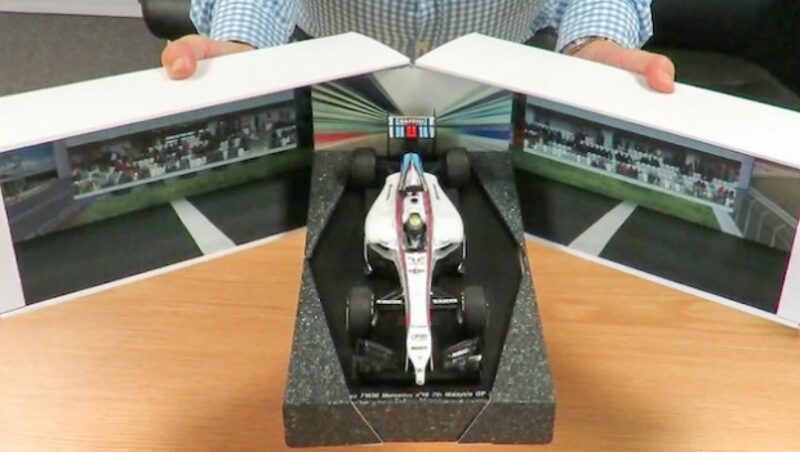 In support of the summit, Swanline Print, a UK corrugated printer, has designed and digitally produced a presentation box for a large 1/18th scale model of a Williams race car. One of these will be given as a prize at the event for the fastest driver in the Williams F1 simulator. The box is a clamshell design with relatively plain white exterior, printed with the FESPA UK and the Digital Corrugated Seminar logos. Inside is another matter: the box opens horizontally to push forward a tray holding the model car, with full colour images of a racetrack and grandstands on the inner surfaces. The open box forms a colourful display stand for the model. The complex structure was designed and previewed in 3D by Swanline using Esko software, then printed on one of its pair of HP FB 10000 flatbed inkjet corrugated printers. The boxes were cut and creased on an Esko Kongsberg flatbed digital cutting table, and hand assembled to hold the model car. Finally a printed paper chequered flag sleeve was slipped over the carton to hold it shut. Speaking to FESPA UK’s Peter Kiddell, Nick Kirby from Swanline Print said that the aim was to show delegates to the summit the complete process from design concept right the way through to short run production. He said his company handles 50% packaging and 50% point of sale. “The correlation between the two industries isn’t always there, but the thought processes and the equipment very much are,” he said. The potential for higher throughput systems is big but still largely untapped, according to Sean Moloney, product manager for Sun Automation’s CorrStream high volume single-pass sheet fed digital printers. The first commercial user is HSG Packaging in Bradford UK, which installed a Beta press early in 2016 and is now running it in production. The major market will be boxes, Moloney says, where numbers far exceed the use of corrugated for display and PoS applications. “The corrugated box industry is huge, second only to publishing,” he states. “When it comes to how many boxes are printed, the market is certainly big enough. The question is how much of that market will give a critical mass, to maintain margins on digital print. However, he reckons that the display market alone can’t justify investment in high capacity digital printers. “The display companies are perfectly happy with flatbeds as they don’t need more capacity (or the price). Bobst’s digital corrugated line uses its own materials handling with Kodak print heads. Bobst has built three digital corrugated lines so far. One is with Model AG in Weinfelden, Switzerland and the other is at Schumacher Packaging in Ebersdorf, Germany. A third has been built for a so far undisclosed site. “We see much broader opportunities for digital than it has covered up until now,” says Jakob Bovin, product marketing director for the Digital Printing Corrugated Board business unit. “With high-volume digital printing technology, the converter is able to address their existing work, customer base and segments, but with a technology that’s better suited to deal with gradually declining run-lengths, as seen in many markets. Bobst also said it is working on a digital carton printing technology, which apparently has a lot in common with the corrugated line. Image: Visitors to a corrugated event at KBA last year saw the 2.8 m HP T1100S in action. In the past decade HP has mostly produced modified HP Scitex UV multi-pass flatbed inkjets for corrugated, plus a version of its big single-pass inkjet web press for liner paper. This changed in 2015 when HP announced the results of its collaboration with KBA to produce a huge and fast 2.8m wide corrugated web press called HP Page Wide Web T1100S. This runs at up to 183 linear metres per minute, or 30,600m2 per hour. The first one is running at DS Smith Packaging at its Featherstone site in the UK. DS Smith also has an HP T400 inkjet web press at its Belper site in the UK, for pre-printing liner paper for corrugated. “We selected the new HP Page Wide Web Press T1100S as the next step in our ground-breaking digital pre-print programme,” said Stefano Rossi, CEO of DS Smith Packaging Division. This year, HP announced the launch of the Page Wide C500, a compact single-pass sheet fed corrugated press, probably for 1.8m wide boards. Shipping is predicted for 2018, but test sites will run in 2017, including UK company Cepac. HP is also working with Smurfit Kappa on development. How does he see the markets for flatbed UV corrugated printers, versus that for the future C500 (which uses a water-based ink)? “The way I look at the market is that some corrugated converters have specialised plant for short run applications, such as Swanline Printing that has two of our flatbed presses,” he says. Will the fast high volume presses go to existing corrugated specialists who today use flexo or litho presses, or will they encourage new players? “I see some indications in both directions,” Shalev says. Like HP, EFI has long seen some of its large flatbed UV inkjet printers being used for short run corrugated board printing. In June this year, it announced Nozomi C18000, a fast single-pass aqueous ink printer that’s dedicated to corrugated work in higher volumes. It’s built in Spain by the EFI Cretaprint factory, which previously has concentrated industrial inkjets for ceramic tiles. “When we look at Nozomi what I think is interesting is that the worlds are colliding,” says G Scott Wood, a senior product manager for large format at EFI. “There used to be a pretty clear segmentation and decision path about when you’d use a piece of digital equipment versus analogue. High speed digital is clouding the waters a bit. You don’t really need to make a choice, it’s a technology that allows scheduling to be very flexible, particularly when you get into the big box independents. Durst presented its fast digital corrugated board press last June. Durst is another company that has offered multi-pass UV flatbed printers for corrugated sheet work, but this year it demonstrated the Rho 130 SPC (single pass corrugated) sheet fed press, with an all-new technology running at 120m per minute on 1.3 x 2.5m boards. Peter Bray, managing director of Durst UK, said the plan is to deliver units in Q1 2017.